Nadia Hall "M.ED. Dip. C.S"; Chaya Kulkarni Ed.D. ; Shauna Seneca B.S.W. Looking for an engaging way to nurture parent and child relationships? This highly practical, activity-based guide shows home visitors what to do and how to do it—and is virtually a training program in itself! Developed out of three different training curricula that have been extensively field-tested and used in workshops across the United States and Canada, this guide gives home visitors creative and proven tools to help parents strengthen their relationships with their children. establishing a framework for successful relationships with families, from initial contact with new families to maintaining positive bonds. ensuring a positive parenting approach through "Comfort, Play, and Teach™" activities. These fun, parent–child activities, divided into 10 age ranges for children from 1 month to five years, focus on emotional, social, intellectual, and gross motor and fine motor development. Parents can be overwhelmed by personal challenges and stressors that compromise their capacity to do the best for their children. Let this be the home visitor's guide to harnessing parents' inherent strengths, building their parenting competencies, and empowering them with useful strategies. Nadia Hall is a professor at the School of Early Childhood Education at Seneca College in Toronto. She teaches courses on infancy, curriculum design, and families. She has delivered workshops and addresses all over Canada, the United States, and New Zealand. Ms. Hall's primary focus in curriculum design and program development has always been infant mental health. She began her professional career as an infant therapist in a home intervention program. Her love of infants led her to create and co-direct the Infant-Parent Learning Program in Toronto, which assisted new parents to understand developmental issues. As the manager of early childhood training programs at Canadian Mothercraft, a multiservice organization providing education, child care, early intervention, and parenting support programs for mothers and their children, she developed a post-diploma specialization in Infancy for Early Childhood Education (ECE) practitioners. In collaboration with Native Child and Family Services, also in Toronto, she created culturally specific child protection training to support children and families in the city's native community. Ms. Hall helped develop an anti-bias post-diploma course in response to her participation on Metro Toronto's Anti-Racist Education in Child Care Committee. With Ministry of Citizenship funding, she coordinated and wrote an ECE vocational language course for foreign-trained early childhood practitioners that assisted immigrant women to complete equivalency teaching requirements. Ms. Hall was a policy analyst for 2 years at the Ministry of Health and worked on a provincial roll out of the home visitation program Healthy Babies, Healthy Children. She then worked for 5 years at Invest in Kids, where she created and delivered training curricula with her co-authors, Chaya Kulkarni and Shauna Seneca, to support professionals who were working with high-risk families and children in the fields of home visitation, child care, and children's mental health. Ms. Hall has written two texts on anti-bias education, The Affective Curriculum: Teaching the Anti-Bias Approach to Young Children (Nelson Canada, 1995), with Valerie Rhomberg, and Creative Resources for the Anti-Bias Classroom (Delmar, 1999). Ms. Hall holds a master's degree from the University of Toronto; a master's of education degree from the Ontario Institute of Education, University of Toronto; a teacher's certificate, primary specialist; and a diploma of child study from the University of Toronto. Chaya Kulkarni is Vice President, Parent and Professional Education, at Invest in Kids in Toronto. She leads the development and implementation of training and resource materials for parents of young children and professionals working directly with families with young children. Dr. Kulkarni brings more than two decades of experience in the field of children's services, policy development, and curriculum development to her work. Prior to joining Invest in Kids, Dr. Kulkarni served as Senior Policy Analyst and Researcher for the Office of the Official Opposition at Queen's Park, where she was able to influence and inform practices surrounding early childhood care and education. She began her career as Executive Director of the Downsview Child Care Center, where she was responsible for the programs and management of a licensed center serving 50 families. Dr. Kulkarni has lectured at Ryerson University and Canadian Mothercraft, both in Toronto. She is an effective and fervent facilitator for numerous training seminars and has served on a variety of boards and associations in the children's services sector, such as the board of directors for Nobody's Perfect Ontario Branch and the board of advisors for the Canadian Child Care Federation Review of Literature on Brain Development. Dr. Kulkarni received her Bachelor of Arts degree from Ryerson University and attained her master's and doctorate degrees in education from the University of Toronto. Shauna Seneca, who passed away in 2006, dedicated her life to serving children and families. After earning a bachelor's degree in social work from the University of Alberta in Edmonton, her career began in 1981 in the Income Support Program with Alberta Family and Social Services, where she worked for 10 years, after which she managed an employment and pre-employment program. During this time she developed curricula and workshops to support individuals and families looking for holistic interventions. In 1994, Mrs. Seneca and her husband created the Bent Arrow Traditional Healing Society, a nonprofit charitable organization serving aboriginal children, youth, and families in achieving their goals and dreams. The society was founded on traditional teachings and values and provided a safe, sober, and inclusionary community. By 2007, the society operated 22 programs and services and employed approximately 100 staff. Among some of the programs provided by the program are Aboriginal Head Start, adolescent pregnancy group homes, foster care, youth pre-employment, and home visitation. During her career, Mrs. Seneca quickly realized that the more proactive and the earlier that supports and services were made available to families, the more likely these families were to obtain and benefit from these supports. To that end, she sat on many provincial committees and community boards, including the Edmonton Police Commission, for which she served as a member between 1998 and 2002. It was during this time that she was instrumental in establishing Orenda House, a transitional housing complex, which provides a substance-free environment for families needing a safe community to practice healthy living. Mrs. Seneca recognized the effectiveness of relationship-based practice and working with families from a strength-based approach early in her career. To that end she played a major role in training nationwide for Invest in Kids in a variety of curricula. Mrs. Seneca was instrumental in helping Invest in Kids adapt resources that were reflective of the First Nation people and their history. In September 2005, Mrs. Seneca received the Women of Vision award. 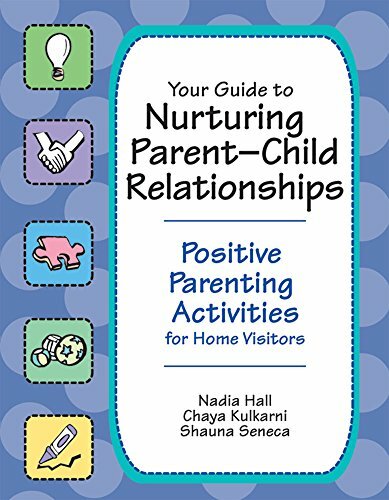 Excerpted from Chapter 1 of Your Guide to Nurturing Parent-Child Relationships: Positive Parenting Activities for Home Visitors, by Nadia Hall, M.Ed., Dip, C.S., M.A., Chaya Kulkarni, Ed.D., M.Ed.,and Shauna Seneca, B.S.W. Many families struggle with limited resources and supports, low self-confidence, and poor understanding of child development. The great diversity of home visiting programs across North America bears witness to home visitation as a powerful and effective way to support families through voluntary, long-term relationships. The variety in programs is seen in the range of purposes and intended outcomes, target populations, and types of interventions. Prevention and early intervention programs also vary with regard to staff background. The roles assumed by many home visitors—educator, nurturer, advocate, collaborator, coordinator, and counselor, to name a few—are shouldered by staff from the fields of nursing, social work, early childhood development, and mental health. However, research has shown that no conclusions can be drawn at this time with regard to individuals from a particular professional or educational discipline being better home visitors than others (Gomby, Culross, & Behrman, 1999). The range in home visitors' knowledge, skill sets, attitudes, and supervisor support all factor into the complex art of working in partnership with families to optimize children's development. A child's developmental path is influenced by a complex and continuous interplay of biology and experience. Both genetic and environmental factors can either buffer or buffet family functioning and thus have a profound effect on a child's growth. As desirable as it might be to predict a child's developmental path based on a vulnerability and resiliency factor formula, research has shown this to be impossible (Invest in Kids, 2004a). What is known from the work of Werner (1995) and Rutter (2000) is that interactions among risk and protective variables are complex and change over time; knowing the factors that create burdens does not inform one about the mechanisms or processes by which such factors operate. The somewhat daunting task for home visitation programs, therefore, is to decide who will benefit the most from this intervention. It is part of a comprehensive program that targets a variety of goals and outcomes. Programs that focus on only one area, such as discipline or feeding issues, usually do not have robust or lasting effects. It is provided by professionals or highly trained and well-supported paraprofessionals. Home-visiting nurses may be particularly important during pregnancy and the immediate postpartum period to help with health-related issues. It is provided to overburdened families. Families who are self-sufficient or have sufficient support from those they know usually experience fewer benefits from home visit programs, whereas families at higher risk will suffer most without services and hence, are likely to show more improvement than low-risk families who do not receive services. Evaluation of the field's efforts still leaves much room for discussion about which intervention works in which ways for which children at which time. Thus, the home visitor must use whatever skills, commitment, knowledge, and support are at his or her disposal to meet the needs of individual families. Bronfenbrenner's ecological model (1979) provided a framework for understanding a child's development within the context of circles of social influence—in other words—the child in the context of the family, the family in the context of the community, and the community in the context of the larger political environment. Dunst's family empowerment model (1988) showed the importance of building on the inherent strengths of families and communities to improve the mental health of children and their families.